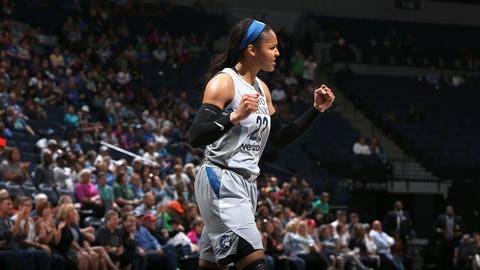 LAS VEGAS — Maya Moore scored 34 points, Sylvia Fowles broke her own franchise single-season rebounding record and the Minnesota Lynx beat the Las Vegas Aces 89-73 on Thursday night to clinch their eighth straight playoff spot. Moore had 16 points in the first half, Fowles grabbed 12 rebounds and the Lynx led 43-37. Fowles’ 11 defensive rebounds were a franchise record for any half. Minnesota had a 57-51 lead with 3:20 left in the third quarter before closing on a 13-4 run as the Aces were held without a field goal. Las Vegas (12-18) has lost five straight — including a forfeited game at Washington. The Aces are 2 games back of eighth-place Dallas. A’ja Wilson scored 18 points, with 10 straight makes at the free-throw line, for the Aces. Tamera Young scored 11 of Las Vegas’ 21 first-quarter points and finished with 16 points.